Fji Vlillage has this week scored one of the best stories to come out of Fiji this week - Sitiveni Rabuka's apology to the family of Timoci Bavadra. Fji Village says Rabuka visited the Bavadra family and Tui Vuda Ratu Josefa Iloilo in the vllage of Viseisei to admit he'd wronged them during the 1987 coup. 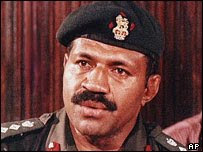 Rabuka deposed the late Doctor Bavadra and his government on May 14, 1987, in what was Fiji's first coup. He told Fiji Village he decided to own up to his mistake after he got a taste of injustice himself, when soldiers came and took his government 4-wheel drive vehicle and his Prime Minister's pension was scrapped earlier this year. 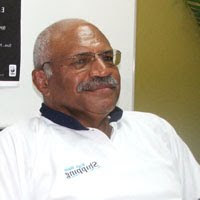 Rabuka went on to say he has already approached senior officers whom he ousted in 1987 as well as the current President and the Army Commander in 1987, Ratu Epeli Nailatikau, who he had also removed from office. RFMF Chief Of Staff, Jim Sanday, is another he has has confessed to, adding an apology was made to the Indians toward the end of his time as Prime Minister, with the Queen getting her apology back in 1997. Rabuka now plans to approach Ratu Epeli Ganilau and the military but says he's not seeking fogiveness, just admiting he made a mistake. Once again its the same old story. He continues to go around saying sorry but never telling the whole truth. So he okay to admit he was wrong but he doesn't want to say sorry? Can we really trust what he says after all this time. Sounds like loss of the vehicle and pension did him a lot of good but who is to know how deep this really goes. And why the apology to the Queen??? What has 'Beta done for Fiji. I've often wondered if Rabuka admits to the frustration he must've felt these years watching those who came after him. I sense a man annoyed that two others dared to follow in his footstep and take the attention from him. What he should focus on however is the untidy mess he left behind. future 'ceremonial'position with a big fat salary? As for the loss of his vehicle? Suggest he tracks down former presidents big expensive 'Hummer' that's somehow disapeared - steal it back? Obvious - although the powers gone - his ego hasn't. This story was broken by the FBC at 12 pm yesterday. Fiji Village did not have it on until 5 pm and did not go with Rabuka to viseisei village. In a deeply moving admission of his own illiteracy, the person responsible for the overthrow of government in 1987, Major Gen (ret) Rabuka, confessed to not making his apologies for the coup in alphabetical order. Rabuka has so far apologised to the Queen, to Indians, to Sanday and to Nailatikau. However his difficulty with letters led to him incorrectly approaching Ganilau after Nailatikau which, being a breach of traditional Fijian protocol, led to a refusal by other senior army officers to accept his apology to them until he learnt his alphabet lesson. In a brave attempt to get closer to the start of the alphabet this week, Rabuka visited the Bavadra family to make an apology but was advised that no audience would be accepted until AA Motors had been apologised to for loss of business during the 1987 coup. When contacted, AA Motors said they weren’t able to receive any apology just yet since they were busy looking for a suitable buyer of the unregistered Pajero that they’d found in their workshop a few weeks ago. And more power to you Mr Cameron! !